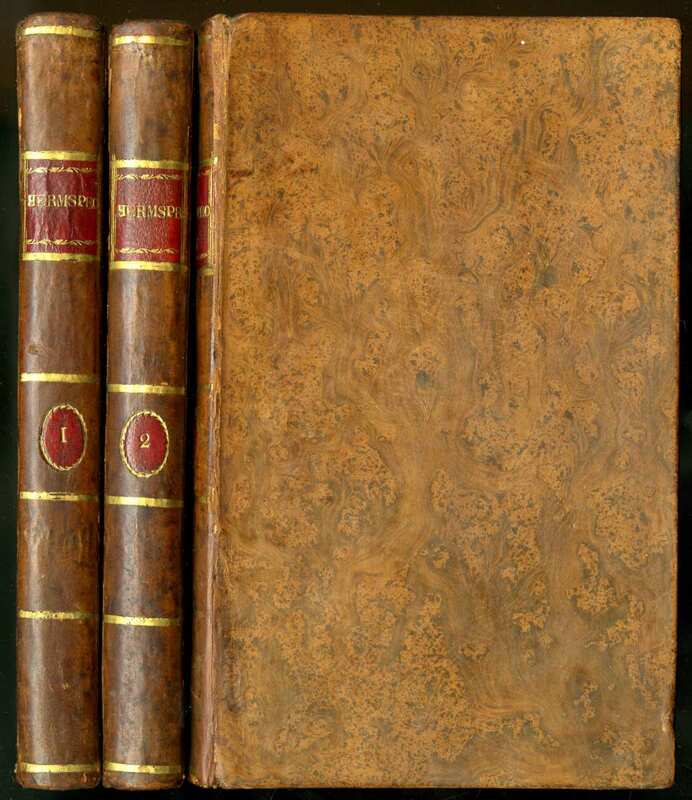 Three vols., 12mo., lacking half-titles but with four pages of advertisements at rear of vol. I (including a long review of Man as he is), and single leaf of advertisements at rear of vol. II; small hole in L6, vol. III, loss of one letter; contemporary tree calf, morocco lettering and numbering-pieces; slight crease to back cover of vol. III, slight cracks to joints but not weak, a very good copy. In Hermsprong, Bage contrasts the deficiencies of English society with the beauties of the utopian community among the ‘aborigines’ of North America. ‘There is occasionally a little tincture of the new philosophy, as it is called, and a shade of gloom is thrown upon human life’ (Critical Review); but his philosophical tendencies never obscure his powerful characterisation and style. The plot turns on the wooing of a peer’s only daughter by an American ‘incognito’ who settles in Cornwall. Despite a considerable contemporary reputation, Bage remains one of the lesser-known novelists of the revolutionary and philosophical school led by William Godwin and Thomas Holcroft. Strongly influenced by Voltaire, Paine, and Rousseau, Bage used his novels to express his ideas about social equality and the rights of man. But Hermsprong is also ‘rich in that half-acid, half-tolerant revelation of the permanent foibles of human nature in which Bage anticipated Jane Austen ... [Bage’s] sound judgement of character, and the pleasant irony of his style, give him at least a place in the company of Fielding, Austen, and Thackeray’ (Blakey, p. 65). Black, The Epistolary Novel, 357; Garside, Raven and Schöwerling 1796:21. HEAVEN AND HELL GLIMPSED BY RUBENS’ ENGRAVER	SUCQUET, Antoine. First edition, a very clean, attractive copy, of an emblem book which unites the spiritual meditations and practices of the Belgian Jesuit Antoine Sucquet with fine emblematic illustrations devised by the great baroque engraver Boetius a Bolswert (c. 1580-1633), called by Praz ‘the illustrator of the sentimental and ecstatic states of the soul’. Boetius a Bolswert’s exquisite refinement gives here, again in Praz’ words, views of Hell and glimpses of Heaven. Man’s worse drives are iconized in satyrs, ghouls, harpies, werewolves, semi-human lizards, his progress towards eternal life ever hindered by the multifarious and rapacious beast within. With his brother Schilte, Boetius was among the most sensitive and felicitous engravers to render Rubens’ drawings. Sucquet’s emblem book was extremely successful, with 177 editions in Latin within a decade, and many vernacular translations.